The Asiatic Question - Open Defiance of the Law. 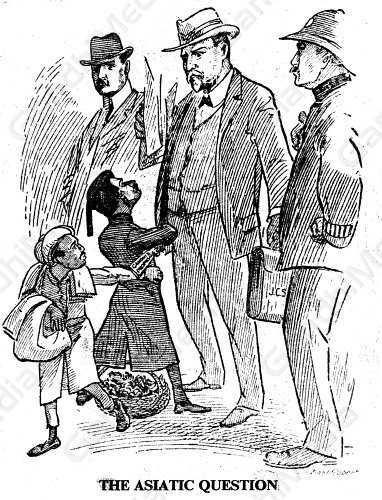 “The sooner the Colonial Secretary makes it clear and the Asiatics realize that the law cannot be defied with impunity the better will it be for all concerned.” - The Star, 1907. As part of the satyagraha hundreds of Indians hawked goods in the towns of the Transvaal without permits. Gandhi is shown demanding from General Botha and the other Boer leaders that he be arrested as the inspirer of the satyagraha, instead of the hawkers. The rigorous application of the immigration laws relating to Asians led to the pauperisation of hundreds of petty traders of Indian origin.